"I grew up with dogs", only very few people can say this to such an extent! Actually, it started before my birth. My mother told me that, two days before I was born, she handled "Canto vom Kirschental" at the OG. 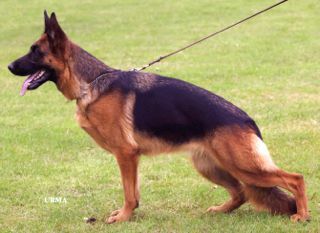 Arnstein in a Schutzhund trial, and on Monday I was born. Dogs were my babysitters, they played with me, were my company, when, once again, no one had time for me. From the first day of my life, I have always had dog around me. My parents had their hands full, to teach me proper and sensible conduct with the dog, they were a wonderful toy, but of course only with their supervision. No sooner was I able to walk, that I helped Papa to clean the kennels and to brush the dogs. I learned dog language very early in life, and gave the puppies good advice for their journey. Here is the future World Sieger "Eiko vom Kirschental" at the age of 7 weeks. My counseling was somewhat useful! I turned into a proven puppy trainer. After four weeks with me, nothing scared the pups anymore. I also prepared them for traffic and drove them around in my little trailer. But then I became sensible and discovered the technic. After I started school, I discovered that there were also people, and that did other things on weekends, than going to the training grounds, to the shows or to the Leistungshüten. I would have also like to have gone swimming, but there was no time for that. Thus my enthusiasm for the dogs, cooled somewhat. At the age of 10, I received my first dog, "Matzo vom Kirschental". Out of fear that he would be sold if something wasn't right, I insisted that he would be registered in MY name. 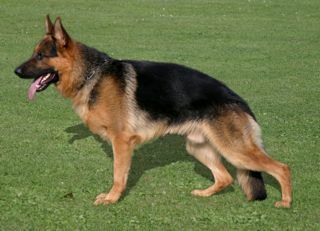 In the that time, we had several progeny and grand progeny from him, in our kennel, that all had inherited his wonderful colors. His biggest passion in life was till his high age, still herding the sheep. In the age of 13 years he died. In 2001 I started my own kennel "vom Haus Kirschental". During the last years I was working a lot with the shepherd dogs. 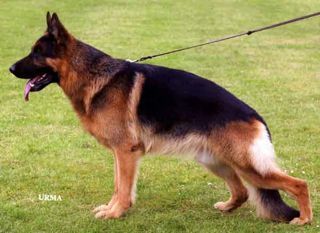 Till the end of 2010 I bred myself 30 litters and I trained and handled several dogs for the breed survey and the show, also Siegershow. In the year 2009 I met my wife Johanna , also I changed my profession. Because of my job now I have unfortunately no more time at the moment for the dogs. But also my wife loves the shepherd dogs a lot. Therefore we have in our house also a family dog named "Woody" who is dearly loved. Woody vom Kirschental on his favorite place! At 2012, august 14th Johanna and I have married. My father, who was at that time in the hospital, insisted that we should marry that time and should not postpone the arranged date. Unfortunately he could not be personly on our marriage, but we visited him in the hospital that day in our wedding dresses. the years are gone and we have now already 2 children, a girl “Nora” and a boy “Jaron”. This both keep us very busy, also I am very busy in my job. May be, that in some more years one of us will be able to continue the breeding.